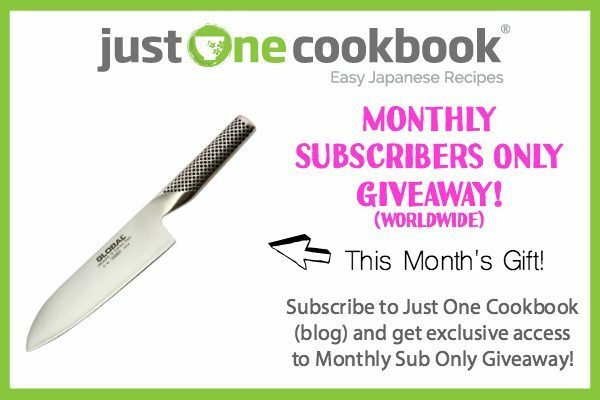 This month I’m giving away one (1) Global G-46 – 7 inch, 18cm Santoku Knife and the winner will also receive a copy of my e-Book, Just One Cookbook – Essential Japanese Recipes. If you live outside of the United States, you will receive $100 Amazon gift card or cash via Paypal. This giveaway closes on Saturday, May 7, 2016 at 12 p.m. PST and is open to participants worldwide (everyone!). I am looking forward to reading your message, and I will read ALL of your comments. If you have a question, please email or tweet me and do not ask here. 2. Subscribe to my YouTube channel and leave a comment below on this post (Ticket 2). 3. Like my Facebook page and leave a comment below on this post (Ticket 3). 4. Follow my Instagram and leave a comment below on this post (Ticket 4). You will have a total of 4 chances to win! Good luck! Thank you for participating this giveaway! The winner is…. Congratulations Helena (#193)! I’ll email you shortly! I really enjoy your blog & cooking Japanese food ! I would love to see a takoyaki recipe! Hello, from Far North Queensland! My family and I love all your recipes!! Have a great weekend! Thanks for your recipes and blog! Hello from Hawaii! I love your recipes. They are so easy to follow especially with the videos and pictures. I am subscribed to receive your YouTube videos! Hi Nami, please include more recipes for the instant pot. Thanks. I subscribed your youtube channel already. 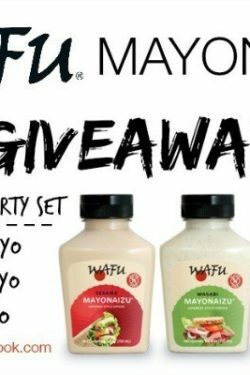 Love all the giveaways you have, and the recipes too! I follow you on YouTube, Instagram & Facebook! None of the little boxes will let me write anything in them. Plus, I’m already signed up to you FB page and YouTube channel. And I would really love both the book and knife. Subscribed to your Youtube and always hungry after! Heehee ???????????????????????? I love going through all of the information and recipes you please! It really helps me replicate my grandma’s cooking! Hello from Melbourne, Australia! Always look forward to your next recipe appearing in my inbox! Good Evening hope you have a wonderful weekend!!! Now subscribed to your YouTube! Also liked your FB page too! Hello! We could use a new knife since we were just commenting how dull our current knife has become! I am already an email subscriber! Thank you for all the great recipes! I do however already follow you on Instagram! Subscribed to your YouTube channel a while ago. Hope that counts for the contest. Hi, ^_^ I’d personally like one month to be a tip on purchasing the goods we need for our perfect JOC kitchen. I definitely watch your Youtube Channel! Hi, I’d be interested to learn how you decide what to cook. Is it just what you feel like, what’s on sale and you use that as a starting point, something else? Hi Nami! Thank you for always giving us your tasty recipes and so many awesome giveaway opportunities! Hi from Melbourne, love all your recipes and have tried a couple of them too. Keep up the good work. Hi Nami! I made your cheesecake last week and it was a hit with my husband and friends! It was also the first time I made meringue, which was an accomplishment in itself! Thank you so much for all of your great recipes and clear instructions and photos/videos!! Been subscribed your newsletter for more than a year and am really love your recipe and your video ! Easy-follow and very clear instruction given ! Keep it up and do continue to publish more recipessss !! From Far-West Texas: Really enjoy your recipes and cooking ideas!!! Nami, I love your blog! I have a couple Japanese cookbooks that I’ve been too intimidated to cook from, but you make it so approachable! Do you have a recipe for yaki tomorokoshi (I hope I’ve got that right)? I don’t know if I should use white or red miso, or how/when to apply it to the corn. Never mind, I just found it under Grilled Corn with Miso Butter!!! Hello!! I love your recipes! I made anko filled mochi just a couple of days ago and it was delicious! Hello Nami! Thank you for this wonderful blog and all your recipes! I’ve heard about something like goma sofy, some kind of tofu made of sesame seeds, do you have some recipes for this to share? Love all your recipes and giveaways. Thank you for sharing! Hello!! I just subscribed to your youtube channel and can’t wait to watch the video for cherry blossom cookies! Oooh, i love global knives! already a subscriber to the newsletter! I follow your youtube channel.Thanks! I follow your blog on facebook, too. Thanks! Hi! I always love watching/reading your posts! Still following your youtube channel! Ayoooooo just liked your Facebook page! Thank you for posting all those yummy recipes! Love trying them out! You are such hard workers! Your hard work is not unnoticed, you have my thanks, praise, and most important of all, you had me at food. I am a subscriber to your wonder emails and awesome Youtube videos. Ayooo just liked your instagram profile!! I did subscribe to your YouTube channel! Hello! Been loving all your recipes! I already “Like ” your FB page too! Introducing my mates to Japanese cuisine in East Gippsland, Victoria, AUSTRALIA. The favourites so far are Prawn and Avocado Sushi and Chicken Teryaki. Nami! My husband really loves your onagiraizu recipes. Thank you so much! I found rainbow carrots at the store, and the purple ones have a yellow middle that looks really pretty when you slice them. They work well for cutting into flowers and are a little sweeter and less woody than normal carrots. I thought I’d let you know because they look really nice in bento! All done. Really enjoy your recipes and posts. Thanks for sharing ! Hi again! I really love your recipes! Thank you for sharing your delicious recipes. I enjoy cooking and trying new food dishes. I;ve subscribed to your instagram, Facebook, youtube, and newsletter. I love your website. It would be great to see more bento recipes, especially ones that are freezer friendly. Thanks! I love your videos, They are very enlightening and show exactly how something is suppose to look like at the various stages. Would you please put up a video on how to make ohagi? Thank you for all your hard work. I am already subscribed to your youtube channel. Have always loved your blog — the recipes you share and stories about your travels. Thank you! Hello I have liked you on Facebook! Hello again! I am SO envious of your trip to Japan, it is our dream vacation destination. : ) I am already signed up for your newsletter, YouTube, and Facebook page. I would love to see more vegetarian/Vegan recipes. It’s funny, all your wonderful recipes are changing the contents of our cupboards. LOL. So, please don’t ever stop, my husband and I seem to be changing to a Japanese diet because of your fabulous food ideas. Thank you so much for your Kumamoto and Ecuador fundraising efforts. Hello, I’m following you on YouTube! I am always looking forward to getting your newsletter with a new recipe and a step-by-step video! Just One Cookbook has provided me with countless recipes that I have adopted in my daily cooking. Easy recipes yet delicious and healthy. My thanks and appreciation go to Nami and the rest of her crew. I follow you on Instagram and just saw the picture of cookies! Yum! 1. I would love to see some bread recipes! I really want to know how to make fluffy Japanese white bread! I’m a subscriber of JOC’s YouTube channel. Hello ! Simply love all you Japanese recipes ???? Thanks for the opportunity to win the Santoku knife! I already subscribe to your YouTube channel and I love watching your videos! I follow you on Instagram, too! I have already subscribedone to your you tube channel and love most of your recipes ..Simply Awesome! Please make more noodle dishes. Already subscribing to your Youtube channel! Big thanks for sharing your wonderful receipes with us! We recently enjoyed your shiojake recipe and enjoyed the lefovers with salmon fried rice, both were delicious! I enjoy hearing about how your family enjoy your dishes Nami! Hello, Nami san. I enjoy receiving your newsletters. I’d love more matcha recipes please! Hi Nami, hello from Australia! Thanks for your recipes and clear instructions. Always looking forward to it! I subscribed your youtube channel already! I went to Hokkaido last summer and all the pastries and bread were unreal. Also just wanted to say that I’m a long-time lurker but I really like your blog. Your recipes work better – and are more detailed – than some “authoritative”/acclaimed (obscenely expensive) cookbooks! Hi, justo wanted to say hello again from France. Thanks a lot for all your recipes! Summer is approaching. I love your dessert recipes a lot. Can you introduce more variety of desserts, both hot and cold. I would love to see them soon. I have subscribed, amd followed justonecookbook on YouTube, Facebook, Instrgram, and Pinterest. Already subscribed to your youtube channel and practiced some recipes 😀 simply awesome!! Thanks for posting all these recipes! Love your banana bread recipe. i love your web page. you have brought a great inspiration into our house for dinner time. i was wondering do you have a good firecarcker recipe. Thank you Justonecookbook for your wonderful recipes and your great giveaway! I really appreciate your cooking posts and how detailed they are. Of course i follow you via You Tube :Helena Oops. And of course I love watching your videos! justonecookbook you re just the best! Already enjoying your blog and great posts.. I subscribe to your YT channel. Your instructions are very easy to follow. I was wondering if you got any recipes that use japanese curry roux block apart from the usual curry? Like an udon soup or some other flavour of curry using that as a base? Also, my family and I love your green tea biscuit recipe. It’s the one I bake most often! I’m subscribed to your channel, liked your facebook and follow you on instagram. Hello! Thanks for tue ne recipes. It’s long time that I would like to buy a new serious knife. I rhink Ir is essential in a kitchen!! I’m still cooking through all of your recipes one by one… Now I’m marinating salmon in miso marinade 😉 Thank you so much for your work!! I liked you FB page! Hey Nami. Hello from france. Me and my girlfriend enjoy so much your recipes ! Especially the dorayaki ! I just subscribed your youtube channel ! Just liked your Facebook page ! Was already following you on instagram. So good pics ! Hi. Still trying to be brave eniugh to try one if your wonderful recipes. Thanks for a lovely site. My family and I love your recipes. Please include more recipes for bento.box. Hiya Nami! 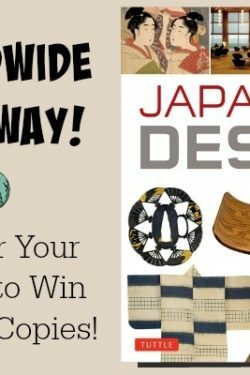 Another awesome contest im dying to participate in! I am looking forward to your new recipe’s after the weekend! Ganbatte! My Feedback: Keep up the amazing things you do! We can’t possibly ask you for any more because you are already doing awesome! I still love every blog, and every recipe you share with us! People in Hawaii live your recipes! Enjoying your great recipes and blog. You’re one of my favorite channel on YouTube. Love that you helped me make delicious Japanese meals for my family — including a dragon roll I will be making for my husband’s birthday treat tomorrow. Hugs from MD! Hi Nami, thanks for this splendid blog and your generosity towards us followers! Thanks to you, not only I discovered japanese cuisine, but Japanese culture and language too (which I’m starting up learning)! I hope to win the prize. I had already subscribed to your YouTube channel! I love and appreciate all the posts you do. A lot of the recipes such at the salmon ochazuke and char Sui with ramen have been amoung my favorite meals to make! I subscribed to your newsletter Nami! Thanks for everything you do for us. I visited Hiroshima in March of 2014 just before the cherry blossoms. While my son and I were there we ate Okonomiyaki. Oh how yummy! Your recipe brings back great memories and tastes just like I remember. I now make it for my friends and they love it too. I can’t wait to see the pictures of your summer trip to Japan (if you are planning on sharing them with us)!! Love your recipes as it brings back a lot of memories from when I was an exchange student in Japan….comfort food! Hi Nami: I truly enjoy your recipes and your sweet spirit. Thank you to you and Mr JOC. Happy to find this excellent site. I’ve learnt a lot about Asian food. Thank you very much. Hello, thanks for all the delicious recipes! I need that Santoku knife!!!! I hope you will post a Japanese milk bread recipe here! Love your blog! Thank you Nami for your generous and creative spirit! Hello from Singapore! I enjoyed your blog postss and videos! I have subscribed to your Youtube Channel. Keep posting the gorgeous cooking videos! Hello from Kuala Lumpur, Malaysia ! Your method of cooking is easy to catch up for me???? Would love to have such a high quality knife like the Santoku! I appreciate your instructional videos. They are very detailed and accurate! Thank you! Look forward to reading your blog each time. It is beautifully done. I get a lot of inspiration from it. Thank you. Hello, I enjoy your recipes. Please keep them coming. love the giveaway! more power! Thank you for always posting and emailing such wonderful content! I follow you on instagram. My user name is kosmosphere. Hi Nami, I love your madeleine recipe, I use it all the time. Greatly enjoy and appreciate your culinary art and your blog. You really are a wonderful ambassador for Japan! Thank you Nami for all your wonderful recipes. You’re a wonderful teacher! My family and I enjoy watching your videos. They have asked me to make some dishes unstead of going out to eat. I have made about half dozen of your recipes and they are so delicious. Thank you sharing your talent, Namiko! Thank you and Mr. JOC for all your hard work! Your you tube channel is one of my favorites. I can’t wait to try the cherry blossom cookies. I follow you on Facebook. (I don’t do Instagram) and love when recipies I haven’t though about in a while, pop up. But can you post more japanese dessert?? I made your Dorayaki recipe except filled with ice cream. 🙂 It was delicious. I am already subscribed to your YouTube channel. I enjoy the confectioneries that you post. I’m hoping to make the pressure cooker Japanese curry one day next month. I am already following you on Instagram. I am a long time subscriber to your newsletter. Love your recipes! Last year when we were in Japan we had an interesting dining experience. It was my birthday and Masahiro’s family arranged a privately catered dinner in the beautiful home of a lady who enjoys cooking for small parties and the service is in her own home. It was a multi course meal….all very delicous and equisitely presented. The star of the meal was a “sushi cake”…a multi layered cake with rice and vegetables and sushi and shiso leaves …beautifully decorated. It took me a little while to figure out that it was not our dessert …. but one of the initial menu offerings …. after our soup. This was an unforgetable experience. The hostess said she had never served a “westerner” before and she was so pleased to hear me exclaim “Oishi” after each course and “Oishkata” at the conclusion. Your recipes are fabulous and so easy to follow. You have inspired my Japanese cooking! Thank you. Such great recipes, clean design, and easy to follow ideas that bring variety to our meals. Thank you for inspiring my culinary adventures. I always enjoy reading about your travels…and, of course, your recipes! “Arrigato” Nami……. (have you ever heard the older country people in the region near Kumamoto say “Dan dan” instead of “Arrigato”? It is pronounced in a sweet gentle manner with the second …”dan” drawn out just a bit longer than the first “Dan..” It really is very endearing. “Dan…dan”. My siser-in-law had never heard it but my elderly mother-in-law who grew up in Kumamoto prefecture…..loved it when I said it to her….She had almost forgotten it. Thanks so much for the recipes and videos! Will be making the carrot ginger dressing/salad today! You always have the best stuff in your giveaways. I like your site and hope we win! Looking forward to stories from your Japan trip. Thank you for all the inspiration you give to me. I have really enjoyed following you. Hi! I love your blog. This is a bit unusual for Japanese food, but do you have any good recipes with yellow summer squash? I’m subscribed to your YouTube channel and I’ve liked your Facebook page! Happy to have learnt so many delicious recipes from your blog! Step by step pictures and videos make them look manageable and inviting to try them out. I have also recommended your blog to several friends! Hope you have a great summer in Japan! Really enjoy your recipes. Love making sushi. My wife and I were in Nikko during a winter snow fall collected traditional artworks and visited the studio of Uichi Shimizu in Kyoto. A private restaurant for two in Nikko during the winter was a very fine experience for us. The hot coals under the table warmed us and the steaming pots of the grand traditional Japanese dinner were extremely well prepared and served by our exclusive hostess server that made the visit exceptional as I illustrated on my website. Keep up the good work – we love MINGEYA. I´m subscribed to the Just One Cookbook YouTube channel. (same email name but with gmail). I like JOC in Facebook. Please give me a good recipe for that delicious Japanese salad sauce which Japanese restaurants serve. Though I haven’t have the opportunity to make then, your cherrie blossom cookies are beautiful and I’m sure they taste incredible. I love all your recipes and videos. AND THE GIVEAWAYS!! Wow! Thank you! I think your videos are almost poetry to watch – beautiful composition and sound. My family and I have enjoyed the homestyle recipes you have posted. Would you be able to post more? Thanks! Hello from Green Valley, AZ! I continue to enjoy your blog! Thank you for sharing your recipes! Any chance on making a Hokkaido sweet roll recipe? I am subscribed to your Youtube Channel!! Nami I love all of your recipes I receive by email. One of my favorites is your Seafood Doria. Thanks, it’s great. Loved the recipe for the onigirazu and unagi sauce! Can’t wait to try more. I really like your facebook page!!! Hi again! I follow you on Facebook too! Thanks also for your pressure cooker recipes and for teaching about ramen too. We love ramen! Thank goodness I had found you. Hi! I like looking at the different recipes. I make various sushi rolls (including inari sushi), donburi and okonomiyaki, often, but I’m always up for inspiration. I’m already a Youtube subscriber but under my Facebook/Google id. I follow you on Facebook using my Facebook/Google ID. I have enjoyed the recipes this spring, esp the sakura cookies. So beautiful. In my adult Japanese class we have been talking about “hanami” and sakura. I also admired your dedication to the anniversary of the 2011 Earthquake and Tsunami relief with mention of the Nozomi Project. You also had dedication to the Kumamoto and Ecuador earthquake relief efforts…. thank you. 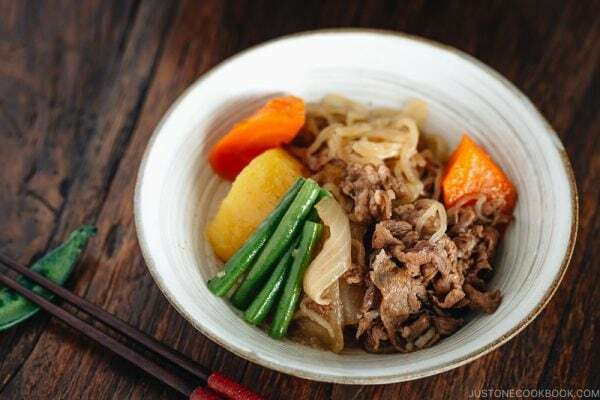 Several months ago you had Kim Chee recipes and I shared them with my Korean friend and that was a great way to integrate the cultural styles and ingredients of cooking. Arigato! I love your recipes! They are always a go to for me. hi! i really like your website!! Hi Nami ???? Thanks for the recipes. I already follow your YouTube channel. Hello! I enjoy your blog very much. I love Asian food. I joined your Youtube channel. Hi from Surrey, B.C. Keep up the great work! Following you on Instagram, like your Facebook page and I subscribe to your Youtube channel! I just subscribed to your youtube channel! I’m already following you on instagram. hehe. Hello Nami! Love all your recipes, you make them very easy to follow and it always turns out so well! Hello, I love your newsletter. Thanks for all the great recipes! Thanks for doing what you’re doing and also for including vegetarian recipes.! Love sharing on my facebook food group page Good, Cheap and Healthy Eats.! Hello from Brazil! Love your récipes!!! Hi! I love the recipes you put on here! Please continue posting your Japanese recipes for the pressure cooker. The ones I’ve prepared have been absolutely delicious. Thanks for all the recipes you have posted! I enjoy your receipes & blog. Keep them coming! 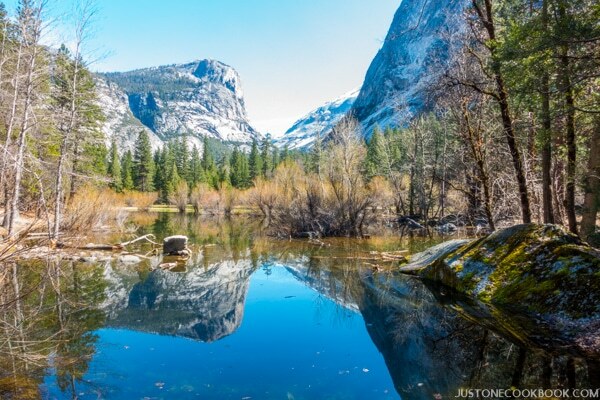 Love your site, especially your travel logs. I need a good knife! Hi , I like your blog. Would you provide us with some gluten free options? Just saying Hi to Justonecookbook! My favorite! Thanks for sharing your recipes with us! Your recipes are simple and always delicious. Nami, your recipes are always reliable and so good! I just love the Just One Cookbook website. It’s my go to site for home cooked Japanese recipes. P.S. 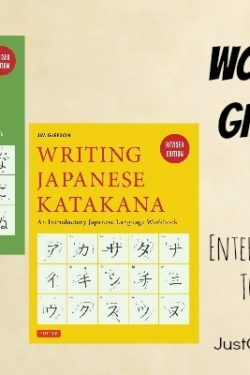 What is the tool used to make tokoroten? I’d like to see if it can be ordered online. Nami I’d love to see a soup curry recipe. I follow your YouTube channel, I love your videos. I love your delicious and accessible recipes. Maybe I guide for college student recipes!? Like, not too expensive or time consuming? JOC fb page – liked! Your blog is amazing, Nami. Keep up the good work! I subscribed to your YouTube channel – it’s great! Hope I can be a lucky one to get the knife and e-book though I am out of the US for now. I’d like to see wagashi recipes! Hi, could you share a recipe for ikameshi If possible, one that uses normal rice and not mochi rice. Thank you! I’ve also liked your Facebook page! Hello Nami, thanks for all the great recipes. Hello Nami, thank you for your recipes! I’m always curious about vegan food, especially vegan versions of popular Japanese & Korean dishes. Liked your Facebook page as Andrea Beata Kadar. I’m following via IG as blackasphodel. Hi! It’s interesting you have a knife for the giveaway since I just moved and was thinking I need a new knife, haha. HI Namiko, it was by Hapy Coincidence that I stumbled across your website/blog. After a lifetime of wanting to visit your beautiful homeland, I have just returned from this great privilege with a group of like-minded (older-age ) students. With a strong yen (forgive the pun !) to try some Japanese cooking, especially now ingredients are so much easier to come by (in my regional area), I look forward to receiving your emails of inspiration. Unfortunately I don’t proscribe to other social media…. I put nearly every recipe you post on Yumly. You are so talented and I appreciate your hard work. Hi Nami! Thank you for amazing recipies! I lived In Osaka after high school for a year with a Norwegian mission society, It was unforgettable. Really miss the food, and your recipies makes it easy for me to cook japanese at home 😀 Love it! #3 Liked your Facebook Page 🙂 Looking forward to see more stuff! Thanks for your emails updates on the new recipes you are sharing on your blog. Love the recipe you share, you make it look so easy. I’d Liked your Facebook page and Followed your Instagram! I’ve been so happy since I found your blog – having new japanese recipes to try has been so tasty! Thanks! Going through these backwards, so I don’t lose my place. I follow you on instagram! I am already subscribed to you on YouTube! Been watching the videos on Youtube. They’re great. I already like/follow your Facebook page! It always makes me hungry during the day! And lastly, I already follow you on Instagram! Thanks for having so many options to see your tasty food! I love your blog and recipes. I can’t think of any I want, that you haven’t done at this moment, but as of late, I’ve become really interested in the agitourism aspect of Japan. The pick your own strawberries and grapes, with dozens of varieties and how they’re grown. If you ever do something like that while on a trip, please write about it. Especially since it is hard to find great produce in the US. Use your recipes a lot! thank you. Still in such awe that you read and respond to all your readers comments and questions! Would love to win this new knife! I’ve been Pinning and enjoying your website for some time. I look forward more visits in the future. Hi, I have enjoyed reading your recipes, Thank you very much. You have sone really awesome work. Are you a pro? Looked like it.???? Just want to say Hello today. I check your blog DAILY. and drooling over all the yummy food you post. I am a subscriber! I love your blog and recipes so much! Thanks for sharing your favorite cooking appliances, tools and products. I really enjoy your recipes. My mother passed away last year and I didn’t get to learn all her recipes so this is a big help. Have to say though some of your recipes are better than hers! Looking forward to more! Arigato gozaimashita. hi, i dont realy know recipes to share……the only thing i do is alot of frozen stuff in the hoven!!!!! I like your site even though some recipes don’t suit me. I wonder if you would consider baking options for recipes that are usually deep fried. I don’t deep fry and I shouldn’t eat it anyway. I would love a recipe of that crab salad stuff that tops some long sushi rolls. I love your recipes. My husband had heart problems and must limit his sodium intake to a maximum of 2000 mg per day. 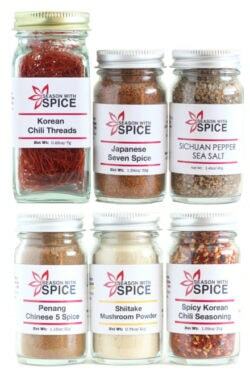 It would be nice to have some low sodium recipes. Do you have a one pot rice recipe where vegetables (example: gobo, carrot, mushroom, etc) are all cooked together in the rice cooker at the same time (some one-pot rices even have salmon). I already subscribe the newsletter, youtube and facebook. Have done all 4 steps! Love Global knives!! Hey, Have you ever think of have a fan meeting/dinner out in Japan? i already subscribe to your youtube channel, nami..! hi, Nami! i already like your facebook page! Just want to let you know that my husband and I love your recipes. Especially the “Baked Tonkatsu” recipe. It’s nice to be able to cook something that delicious and make it healthier without changing all the ingredients 🙂 Thanks for making it possible for us to eat japanese food in Norway! I love Just One Cookbook, I come on here for everything! Thank you for posting out such great recipes. hello, I loved the Sakura cookies recipe. With summer coming up, can you do some fancy shaved ice/kakigouri recipes? I miss the gourmet flavors I would try when I was living in Japan! hola from miami! your recipes rock! Thank you for all your dedication. It’s amazing how much the quality of my bentos improved thanks to your blog. Greetings!! Hi! I’m on vacation visiting Japan! Hi Nami! I always love having sharp knives available. Hello! Thanks for the giveaway opportunity! I am following you on instragram! Loved reading about your travels in Japan! I hope to visit there one day! My favorite recipe I’ve made so far from this blog are the baked croquettes! I love all your recipes. I love chinese bakery buns so maybe more of those and perhaps one pot meals because we all hate dishes. Hi Nami, looking forward to your travel posts this summer when you go to Japan! Hi Nami, I really love your blog. I enjoy reading it everyday. Thanks. Keep up your delicious work. Konnichiha! Oryouri oshiete itadaite arigatou gozaimasu! Kore kara mo yoroshiku onegai shimasu. 🙂 Thank you from Canada! Hi Nami! Thanks for this great giveaway! I wanted to say thank you for your recent fundraisers for the earthquakes in Kyushu and Ecuador and I was also really happy to learn about some good relief organizations. Thanks so much! It is always great to watch your video and learn from you. I am subscribed to your YouTube channel ..
but that email address is different from the one I am subscribed to your newsletter with – will that be a problem? I love your blog n that simple recipe.. it helps me alot. thanks!! I love your videos, so helpful! The baked tonkatsu is my favorite so far, so much easier than frying. I’d love to see a monjayaki tutorial if that’s possible to make at home. Thanks again for all your helpful instructions! I’m subscribed to your Instagram as @4nthem, thanks for all the lovely pictures! I first found your YouTube when I was trying to find instructions on how to make jelly with agar powder. Your tutorial was so helpful, the coffee jelly was delicious! Thanks for making it, I’m subscribed to your channel also. I would love to see more Instant Pot recipes. Thanks for the giveaway. I’m already a subscriber to your YouTube channel. I am enjoying your blog and the YouTube videos. Oiishi! I’m going to Japan this summer too (June 2016)! Looking forward to visiting friends, great food, baseball games & onsen’s. I’m a new member of your page, and I like your recipes. Aloha, j.
I love your spicy karaage recipe. It is one of my husband’s favorites. I have been subscribed to your Facebook and YouTube channels for a few months and recently started following you on Instagram. Sorry if this posted twice. I got an error message the first time. I just wanted to tell you how awesome your recipes are!!! I wanted to request a recipe of Pan!!! Its funny because here in the Philippines specially here in Surigao we call bread Pan too!! I just knew how much we have in common with other parts of Asia too! Especially Japan!!! P.s this is the only japanese cuisine site i m following!!! Hoping for more fun and amazing recipes to come!!!! Oh, I forgot to mention that your photography is amazing. Just subscribed to you YouTube channel! Hello! I love your recipes! I love your recipes, your website always makes me hungry and eager to try new recipes. I liked your Facbook page a while ago. Hello Nami! Thank you for organising a new giveaway! I couldn’t put my finger on the snack my Japanese host mom made me back then, but I know what it is now: melon pan. If you could share a recipe to make them, that would be wonderful! Thank you for all the recipes again! I also like your page on Facebook, it helps me find inspiration when it comes to what I want to eat! Merci !